You turn if you want to - Cleggie's not for turning. Richard Morris points out that, when it comes to incompetence in the Government, it's the Blue side that is all over the place. Mark Thompson has little time for those playing up the "exceptional circumstances" in the latest GDP figures. Over on The Spectator, there is praise for the BBC's Panorama team - and laments a lack of Freedom of Speech in workplaces across the country. A benefit of being late in posting this edition means I can include this post from Stephen Glenn on British Summer Time - and the need to keep putting the clocks back! ...and finally, the name's Bond, James Bond: an infographic celebrating the iconic character and another celebrating the music. Roll up! Roll up! It's time for a weekly digest of just six of the blogposts and articles to have interested me this week..
First up (and with a hat-tip to Mark Thompson for this) is Nick Barlow who reckons that Nick Clegg could learn a thing or two about media management and policy positioning from Michael Gove. Meanwhile another expert in media "management", Peter Mandelson has been speaking about domestic politics - LabourList has the details. Talking about domestic politics, the fantastic Lynne Featherstone has been recognised for her sterling work on Equal Marriage by Attitude Magazine - I may even have to buy a copy, assuming they have an "Awards Issue". North of the border, the stage has now been set for the Independence referendum. Dan Falchikov has an exclusive on the SNP's preferred wording and their campaign video. Things on the continent are, as we all know, economically stormy. Fear not, though, by 2016 Greece will be the best place to live in the Eurozone. The Bond Vigilantes have the details, complete with graphs to prove it! And finally, this amused me (although obviously not the part about the driver sustaining head injuries)... Now, who's for a KFC? Have you ever thought how you would live if someone you loved went missing? How would you cope? What would you do? Could you get on with your life if they were gone for a prolonged period of time? Would you be able to keep hope for their return alive? And how would you react if they did return? According to Missing People, around 250,000 people go missing in the UK alone each year. Of those, an estimated 140,000 are under 18. Whilst people will go missing for a whole host of reasons - fleeing abusive relationships within the home not least - such disappearances must have a huge impact on those left behind but, aside from a handful of high profile cases these go largely unreported. 250,000 is around 0.4% of the population so if you allow for an average of just two people (parents, siblings or partners, say) remaining in the home then the figures would suggest that every year just over 1 in a 100 of us is directly affected by the issue. And that, of course, is a gross simplification as many, many others will be affected - friends, more distant relatives, colleagues, employers et.c. It's a huge but largely unrecognised issue and one which I may well come back to. The purpose of the above opening paragraphs, though, was to provoke you to think of how you would react and feel if you had a missing a relative. What would you do, how would it affect your life? And what if you received a phone call out of the blue after a period of three years, suggesting that your relative had been found thousand of miles away on another continent? And what if that person turned out not to be your relative after all? 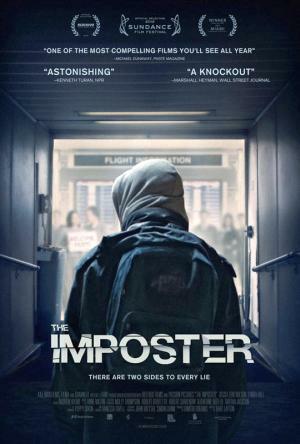 The Imposter relates such a story - Nicholas Barclay went missing from his home in San Antonio in Texas in 1994. In 1997, they received a call saying he had been found in Spain. His sister flew out to pick him up and he was taken back into the bosom of the family. A happy ending, you'd have thought... except the new Nicholas was an imposter; in reality he was Frédéric Bourdin, a Fenchman with a long history of impersonating others. This much is known from the start, so it is no spoiler. The film sets out not explore what happened but why. Why would someone pretend to be someone they had never met and didn't overly resemble? And why would a family take such a person in? The film tells the story from both side, using interviews with the main protagonists, letting them outline their thoughts and feelings at the time with flashbacks reconstructed to fit the narrative along with some home video footage of key moments. Unusually (perhaps) for a documentary, there is a sense of tension as the story unfolds. A dramatic feeling that the imposter must sure be unmasked as at each turn he becomes more an more audacious. But his audacity persists and his acceptance by the family raises new questions: why are they doing this? By accepting the fake Nicholas are they somehow acknowledging the permanent loss of the old Nicholas? Do they know more than they say about the situation? By engaging both sides, the film sensitively explores a bizarre and bewildering story which has the capacity to baffle and bemuse. I lost count of the of the number of times I shook my head in disbelief as the drama played out. Towards the end, the film takes an unexpected twist and I was less comfortable with the framing device used for the end - which felt slightly crass. Overall, though, The Imposter is a fascinating documentary telling an outlandish tale which is exceptional in many, many respects. The film explores what motivates and drives us as humans, how our experiences can affect what we feel is rational or logical behaviour, and how our judgement can be shaped by our desires. Those of us who have never been - and hopefully never will be - in the position of having a missing relative can only guess at how we would feel and act in such circumstances. This film gives us food for thought as to whether we would let ourselves be fooled by the chance of another shot at a full family life: would you buy a lie in order to return to "normality"? I thoroughly recommend The Imposter - it's a dramatic documentary tale which is told with the right mix of pace, mystery and tension. I also recommend you visit the Missing People website to explore the less outlandish side of this under-reported issue. Amongst other things, it has lots of interesting and informative briefing notes on the subject. Welcome to another edition of Saturday Six, a hand-picked selection of some of my favourite blogposts and articles from the last week. Kicking things of this week, Caron takes up Jeremy Hunt's comments on abortion and seeks to move the debate on by raising the issue of 2 doctor's signatures being required - as she says, no other medical procedure requires this. Next up is, ah, Caron again - this time urging Nick Clegg to say no to the Tories on their fanatical obsession with saving a further £10bn from the Welfare budget. Whilst some Welfare savings may be possible, Millennium Dome has a good breakdown of how little of the overall Welfare budget would be available for cuts. Alex also looks at the issue and uses it to explore the issue of policy making within the coalition. This link is to a woman's magazine which I wouldn't normally read - the link was courtesy of Dermot O'Leary on Twitter though, and I like the idea: simply, Refuge - the anti-domestic violence charity - has opened a gift list with John Lewis to provide Christmas presents for kids who would otherwise have none. And finally, if you're a Lib Dem voting rep and you haven't already seen this list of candidates for the FCC and FPC, complete with links to Questions and Answers on some key issues, you really should. Jennie has done and is doing a fantastic job compiling these. And that's it for another week! With thanks to this site for doing the Maths on UK singles. The Blog That Peter Wrote takes issue with the New Statesman carrying an advert for a "Gay Cure" charity - and their apology. Lib Dem Voice's Mark Pack has details of the Institute for Fiscal Studies' analysis of the new Tuition Fees system. Jimmy Savile and the varying abuse allegations against him have been in the news this week. I thought piece in The Mirror was very interesting. Julian Huppert MP has authored this excellent piece on the Draft Data Communications Bill. One of the worst expressions in popular use these days is "that's so gay"... Stephen offers us some alternatives. Finally, one of Tate Modern's Rothko's has been defaced - I can't quite fathom how this could happen! Apologies for the tardiness this week - I promise to try harder next week! Yep, it may be cheesy, but I still love that song - a slab of pure pop!